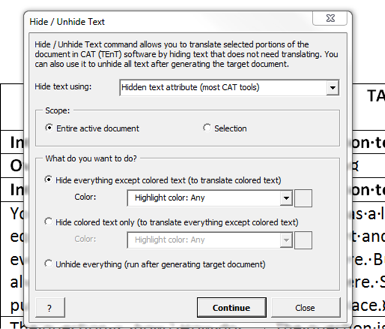 We received this question from a user: If I only want to translate one column in a table in my Word file, can I use MateCat? Yes, you can! 1. If the table is not already bilingual, copy the source text in the target column (as above) and highlight the part that you need to translate. 5. Click Continue. The text which does NOT need to be translated will now appear underlined with a dotted line. This shows that this text is now hidden text. 6. Open the DOC file in Matecat or Trados: only the text we highlighted in yellow will be considered. Once the target file has been saved, the yellow column will be overwritten with the translation, and the rest will be left as per the source file. How to translate only a few columns of an Excel file in MateCat? Solution: hide column A, and resave the file. Then, load the file in MateCat and translate. Once downloaded, unhide the column and deliver. Scenario 2: Column A in the Excel file needs to be translated, but the translated text should be placed in column B. Solution: Copy column A to column B, and hide column A. Then, load the file in MateCat and translate.